When death and loss are closer than you are prepared to deal with, what happens to you? How do you process this information? Does fear and panic take over and if so, for how long? Does the flight or fight reaction come to the surface? The reality is none of us are getting out of this world alive. Consider for a moment which side of the death and dying coin you are on. Are you the person who is potentially near death, as in knowing this is going to happen soon due to illness or whatever reason, or are you the person observing and walking this path with the possibly dying individual? A sub note here is that we are dying and many have no idea when their time on earth is up. No matter where you are in the dying journey or what side of the coin you are on, if there is a close relationship between the individuals involved there may be a number of concerns to ponder. Concerns such as; trust, sharing, fears, regrets, how to live life now or not and how to maneuver or “be” for the rest of your life may be on your mind. Do you trust yourself enough to be authentic all the time or do you feel the need to hide some aspects of you from others? 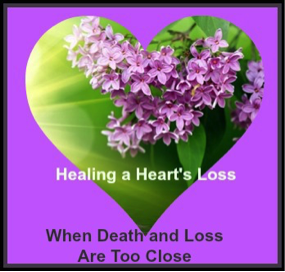 Are you protecting yourself or someone else from truly feeling the impact of a loss, your loss? A part of me wants to say “YES”! Most definitely this is the case. What comes to mind is “do no harm” to anyone and at the same time people wanting to protect each other from the worry that comes with loss; maybe more than one loss scenario. Not wanting to see the depth of sadness in another’s eyes. Words left unspoken or unwritten can never be retrieved once death occurs. Live life with no regrets; repair fractured relationships and dance as if no one is watching. Choose love instead of hate. What do you do when faced with life and death? There are no retakes or do overs, this is your life. Who decides for you? Well, it is supposed to be “you” who decides what is best for you; isn’t it? Let your wishes be known long before death is at the door step. No matter where you are positioned on the side of death and loss, most of all “LIVE YOUR LIFE TO THE END”! What have you got to lose?